Your employees have different needs when it comes to specialist literature, and would like to be able to order the items concerned on an individual and independent basis. It is meanwhile vital to you to maintain supervision over the auditing procedures concerned and avoid unnecessary costs. It is for this reason that we offer you ims Online, a fully electronic subscription, administration and ordering system. The ims online catalogue, which is updated every day, offers you access to more than 14 million worldwide titles in both print and digital formats. 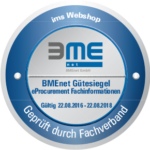 Orders are immediately transferred online, processed by our Customer Service department and approved, likewise immediately and as required, via the eProcurement system. This allows you to manage your orders and subscriptions, and also your users and readers, in an easy and convenient way, while doing away with administrative tasks. Individualised reports supply you with permanent and full transparency regarding your stocks of media resources and their usage, broken down by department or cost centre. As an ims customer, you have your own password-protected access to online resources designed to offer you a fast, direct service. A smart search function based on various algorithms supplies you with precise results ‒ along with easy-to-use filtering and sorting functions for thinning out the hit list. A click of your mouse is all it takes to place your selected article in the shopping cart and trigger the easy ordering process. 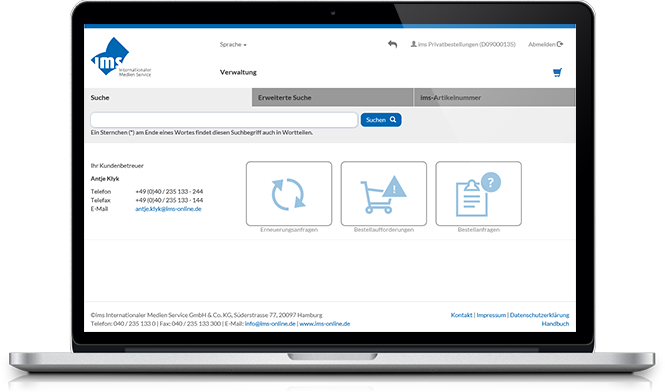 Depending on the type of connection, your order data will be processed directly by us or transferred initially to your internal eProcurement system. You can track the status of your current orders online at any time. 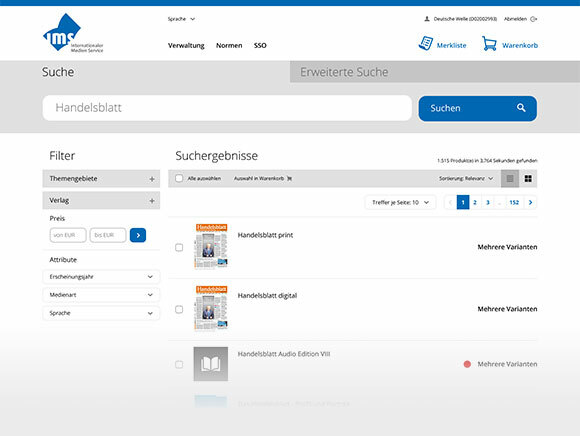 You and your employees can use the password-protected customer area of the ims website to manage orders and subscriptions in accordance with your precise information needs. You can create and manage circulation lists and assign subscriptions and orders to individual cost centres and departments. This feature also lets you edit and update lists of authorised users as, for example, people leave your employ or are newly appointed by your organisation. Use this facility to establish watch-lists of interesting titles, initiate order enquiries or receive order solicitations for publications that are constantly being updated. You can also ask to be reminded in advance of subscriptions that are due to expire, so that you can submit the corresponding renewal request in good time. This lets you avoid unnecessary subscriptions and related costs. Our Customer Service department can also perform these tasks on your behalf if you so wish. We will be pleased to advise you regarding an individual solution to literature requirements in your business or institution. Just call us. 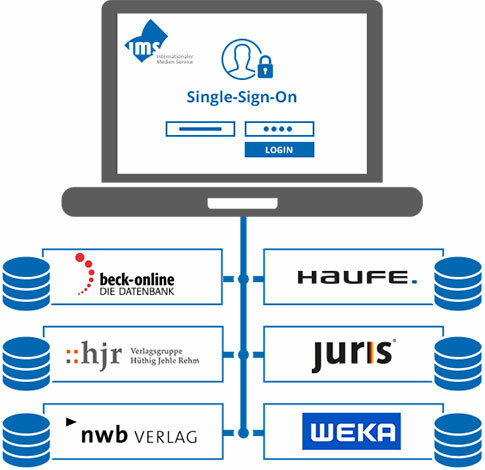 Use the new developed single sign-on (SSO) web service developed by ims, an online tool designed to allow access to subscribed databases via a single web interface. You just need a username and password to log on to all your licensed online databases. This translates into considerably more convenience and time saved for you as a subscriber. Multiple accesses do not require different log-in procedures, so you save both time and money. Does this offer interest you? If it does, we would be pleased to show you what a customised solution for your organisation might look like.